John R. Walker, DBA, CHA, FMP, is a Fulbright Senior Specialist and the McKibbon Professor of Hotel and Restaurant Management at the School of Hotel and Restaurant Management at the University of South Florida, Sarasota-Manatee. • New and updated case studies have been added to the end of each chapter. Chapter 6 has the addition of brand new social media recruiting and hiring suggestions, detailing the use of LinkedIn and Instagram in the workplace. • Coverage of diversity in the workplace has been revised and expanded in Chapter 5. • Updated coverage on delegation, which includes sections on supervisors delegating and common mistakes in delegating. • Now Featuring WileyPLUS Learning Space! WileyPLUS Learning Space is an easy way for students to learn, collaborate, and grow. With WileyPLUS Learning Space, students create a personalized study plan, assess progress along the way, and make deeper connections as they interact with the course material and each other. 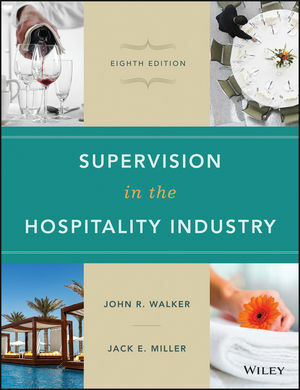 • Focuses directly on leading human resources, especially front-line associates, and applying the wisdom of leadership theory and experience to the hard realities of the hospitality industry in down-to-earth terms. • Enhanced with more industry examples and the addition of new key terms and concepts. • Learning objectives have been inserted directly into the chapters to facilitate and monitor the learning process. • An improved organizational structure, with special attention paid to chunking large sections of content into more manageable, easier-to-remember sections.